Create an entire library with these classic bookcases. 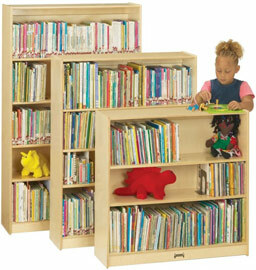 Available in three heights, each bookcase measures 36½" wide and 12" deep. Shelves adjust in 1¼" increments. Safety features include rounded edges and corners and sturdy kickplates. A recommended wall-fastener is included for extra stability. Extra durable, non-toxic and lead-free KYDZTuff® finish that will not yellow. This unit ships ready-to-assemble and includes a lifetime factory warranty. 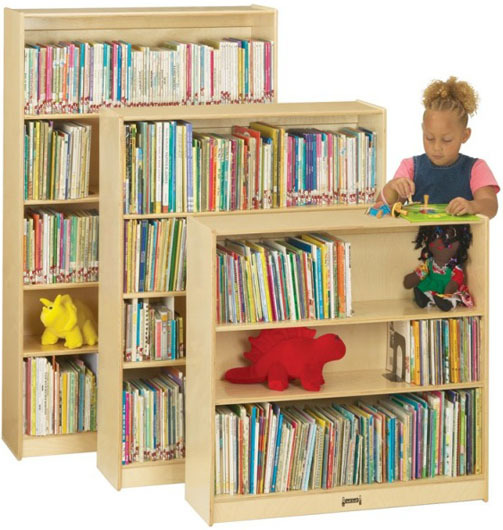 36" BOOKCASE: 36½" Wide x 12" Deep x 36" High, Shpg. Wt.= 52 lbs. 48" BOOKCASE: 36½" Wide x 12" Deep x 48" High, Shpg. Wt.= 66 lbs. 60" BOOKCASE: 36½" Wide x 12" Deep x 60" High, Shpg. Wt.= 84 lbs. Eco-friendly features of Baltic Birch school furniture - click for info.